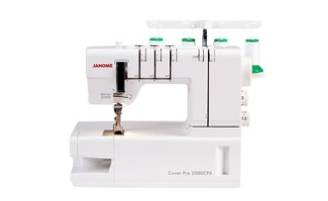 The CoverPro 2000CPX’s innovative design is based on the marriage of an industrial style cover hem machine and a convenient home sewing machine. This means it sews like a sewing machine with all the dials conveniently located. It has a much larger arm space than competitor models and it has a freearm facility that is unique to this type of machine. It is not an overlocker. The resulting union has produced a high speed, long arm, heavy duty cover hem machine, that looks and operates like a sewing machine. For that totally professional finish choose the CoverPro 2000CPX.